This isn’t what I had planned on posting today, but it will have to do. 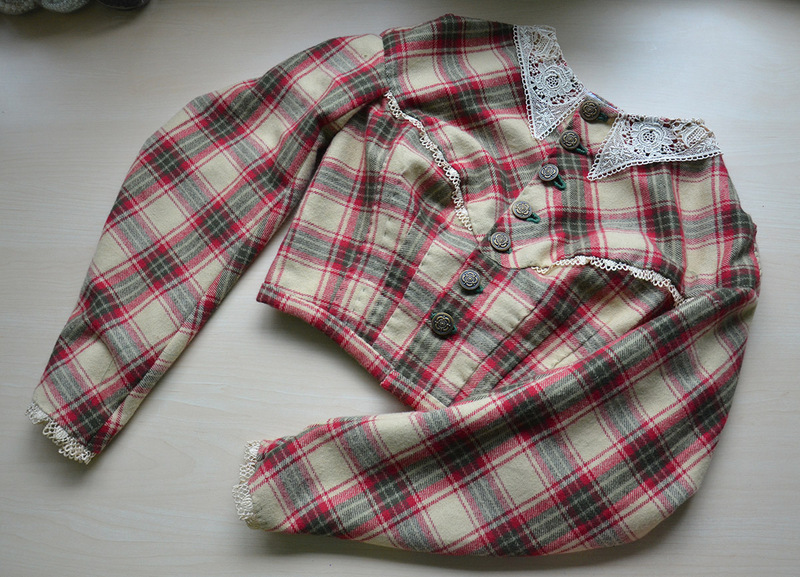 This is part two in making my Civil War era plaid dress, part one talks about making the bodice and is posted here! Unfortunately for me, I had to draft a sleeve pattern for this project. Which I do for most of my projects, but they usually aren’t this weird. It’s actually a fairly common historical sleeve design, just strange by modern standards. 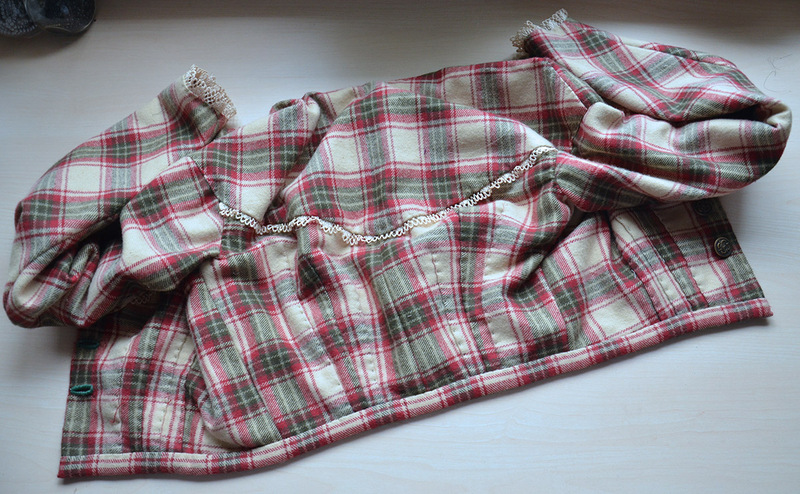 They are made from one piece of fabric that is slashed from the elbow to the wrist. They have seams at the back extending from the elbow down, and ones at the front. Surprisingly, I was happy with that. 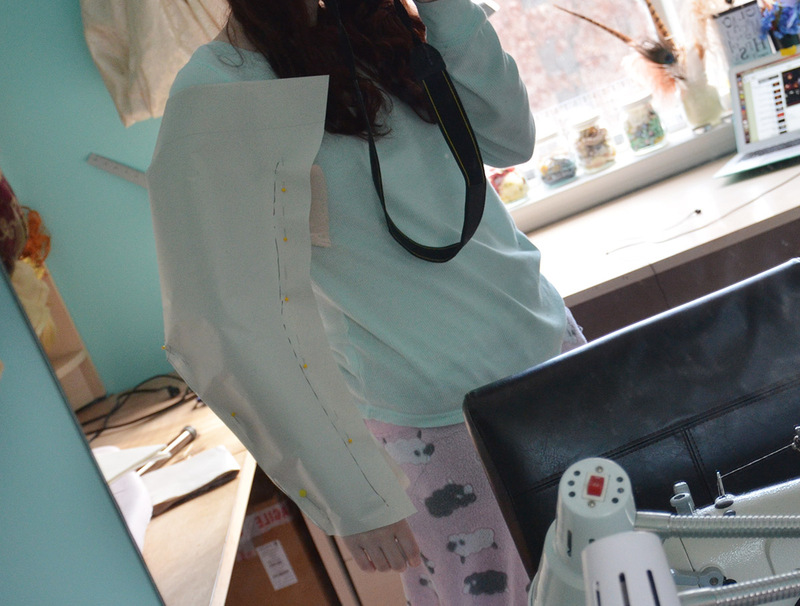 It was actually pretty close to what I wanted, I just made a few alterations and then used it to cut a mock up. Once again I was pleased! They had roughly the shape I wanted and the fit was good. All I did was raise the sleeve cap at the back. My original pattern is laid on top of the pattern I altered after making the mock up, so you can get a good idea of the changes I made! 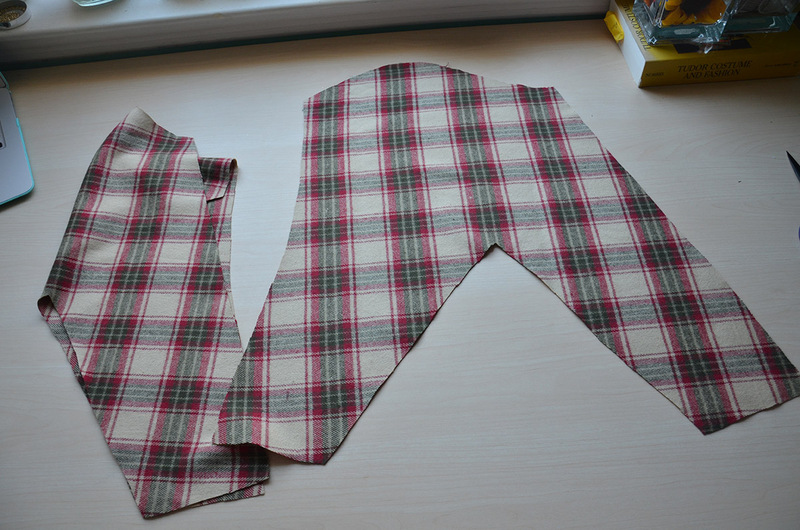 And here the sleeves are, cut from the plaid fabric. 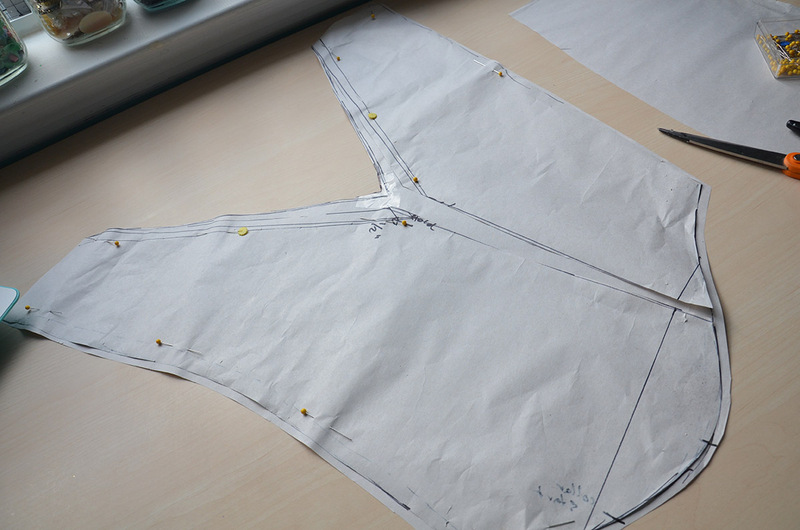 I stitched up the back seam and pressed the seams open, then I marked out the hem at the cuff. Those got sewn up by hand with a running stitch. 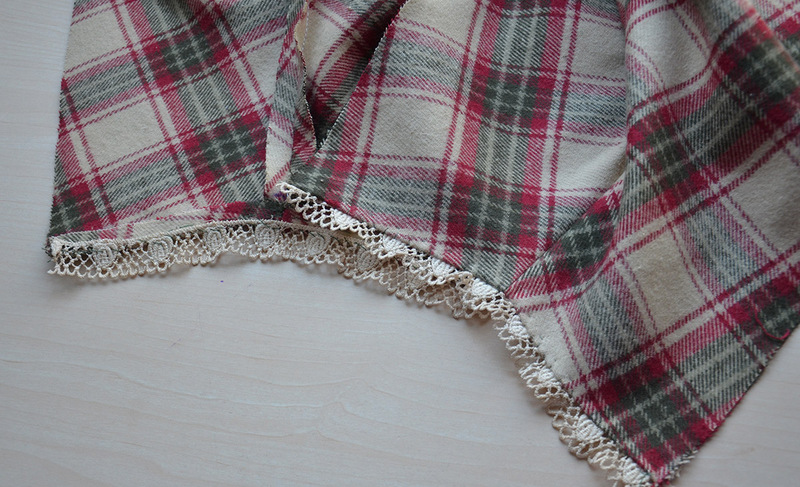 Then I added a little bit of lace, this is the same lace I used on the bust of the bodice. I had just enough to use it on the cuffs too! I did up the front seam and they were looking pretty good! 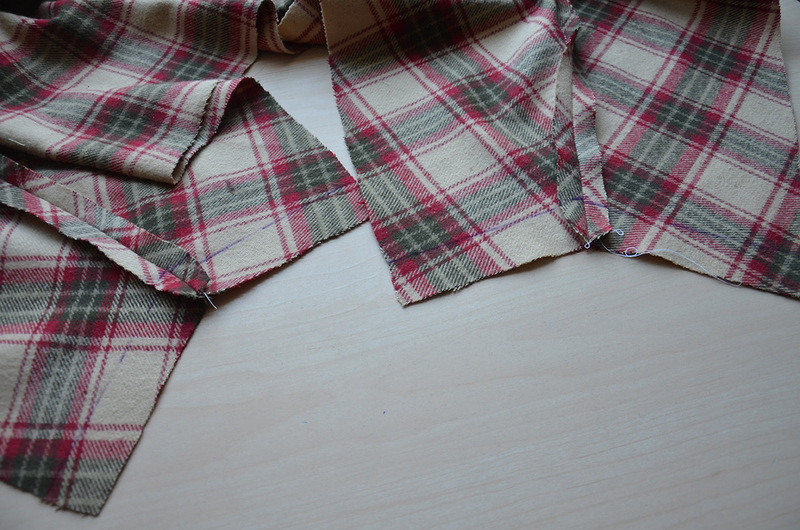 I’m a little angry at myself because the plaid pattern doesn’t line up at these seams. I wasn’t expecting it to come even close, but after sewing them I realized if I had been more careful I could have cut them in a way that they would line up. I don’t have enough fabric for a second attempt so i’ll have to live with it. Ugh! I made up a second set of sleeves, this time from the typical cheap polyester lining. 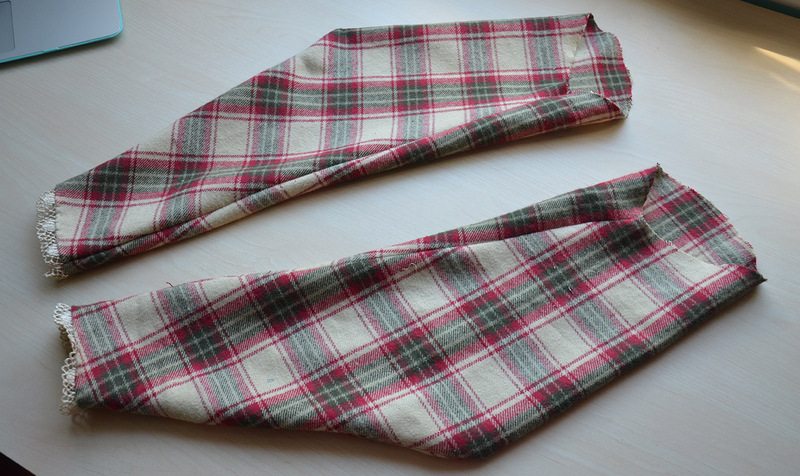 These were attached by hand to the interior of the plaid sleeves. 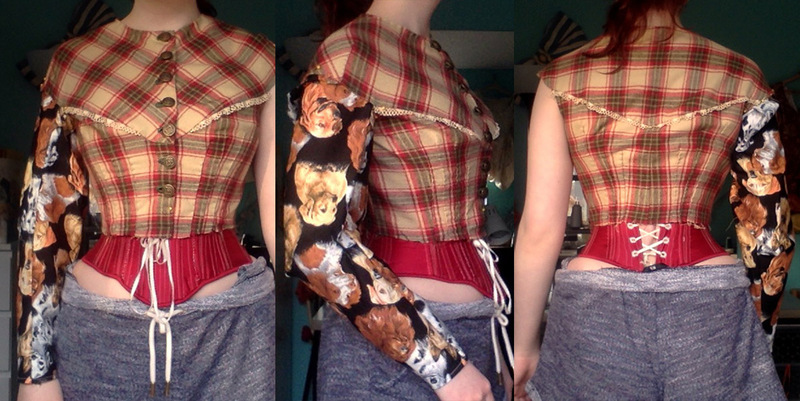 Then the sleeves got attached onto the bodice. The pictures below show them basted in place, but they got sewn on properly shortly after. 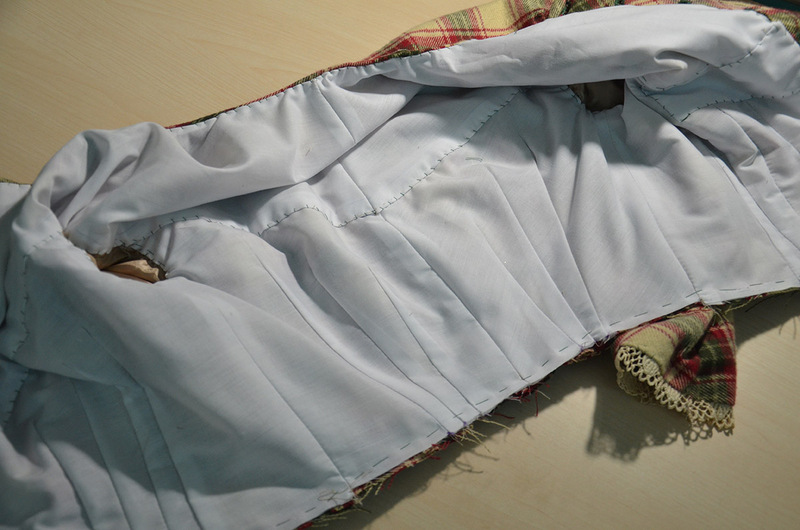 When the sleeves were secured I started on the bodice lining. 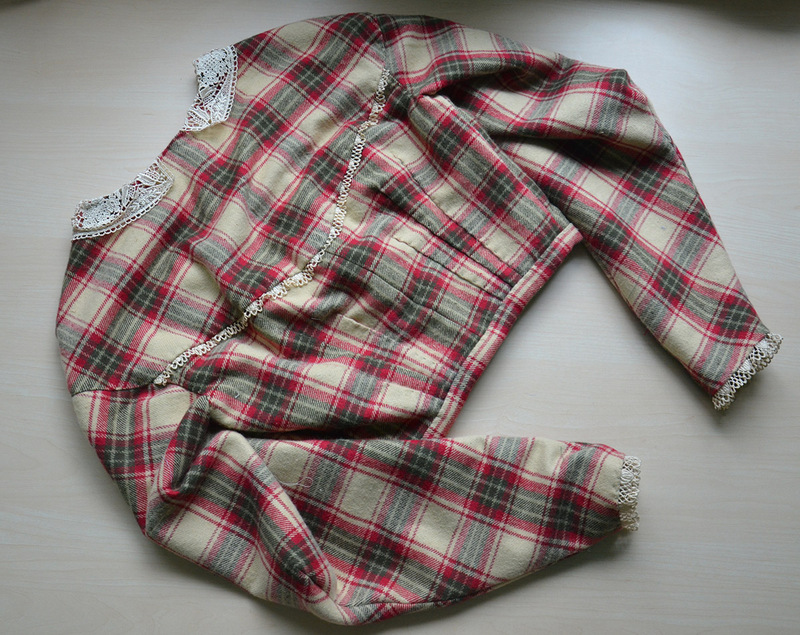 The bodice lining was cut from the same pattern as the plaid layer and stitched in place with a whip stitch. The main difference is that the collar and body of the lining were sewn in separately instead of being stitched together. 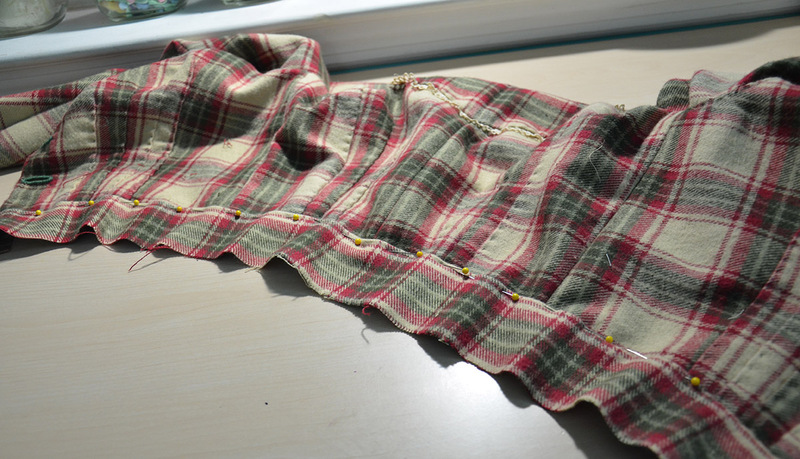 I also darted the lining instead of pleating it. I decided last minute to make this separate from the skirt, so it technically isn’t a dress, but i’m calling it that anyway. 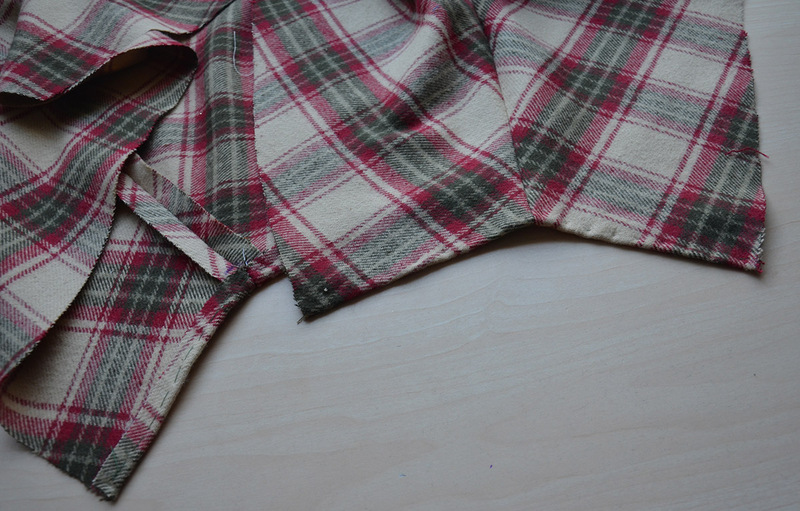 To finish off the bottom edge I cut a strip of plaid fabric and sewed it onto the edge. I thought it was done, but then I remembered that it needed a collar! 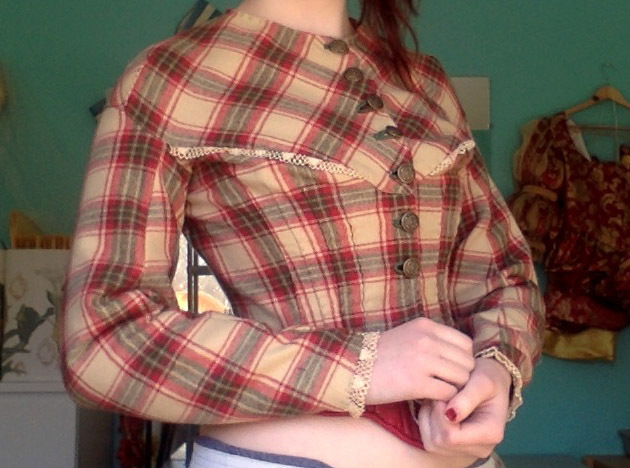 I had intended on making a collar from cotton or linen but I didn’t have any that matched the oatmeal color in the plaid. 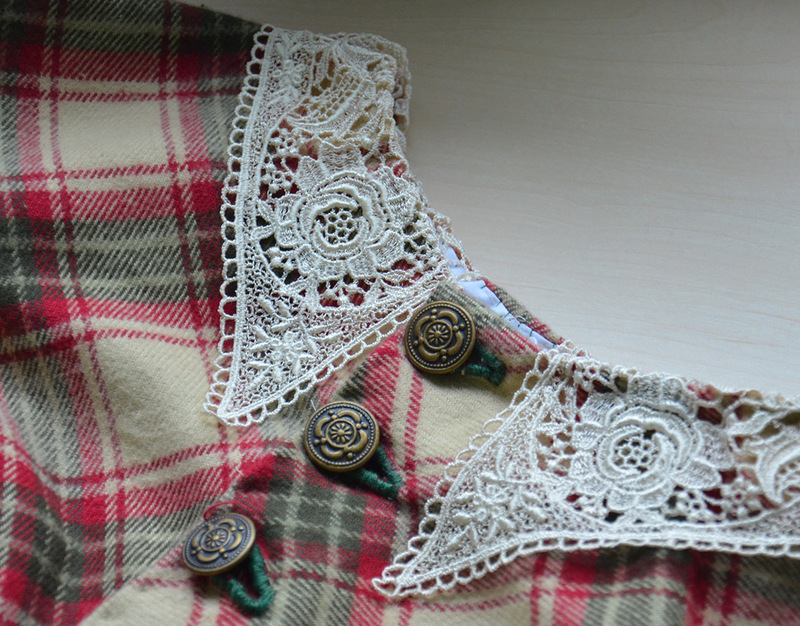 I searched my stash for a bit and came across lace collars I was given a while ago, I thought that might look prettier then a cotton collar so I sewed it on. The color doesn’t match so I’m not sure how I feel about it. Usually the collars would be white or ivory, regardless of the dress color, so it isn’t completely wrong, but it bothers me. I’m going to leave it on for now and I can always switch it out with something else later on. That is it for today! This costume is actually completely finished now! 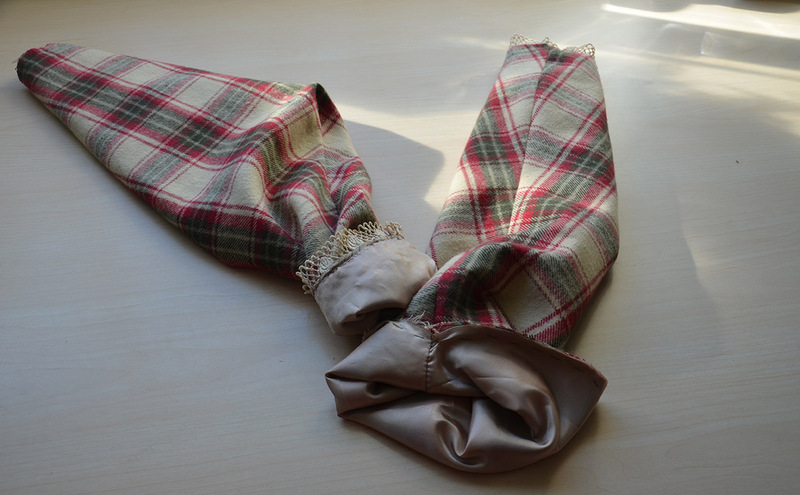 But It will be a week before I post about the skirt and get photos of the finished ensemble. Also: I had planned on posting something festive today but that didn’t really work out. 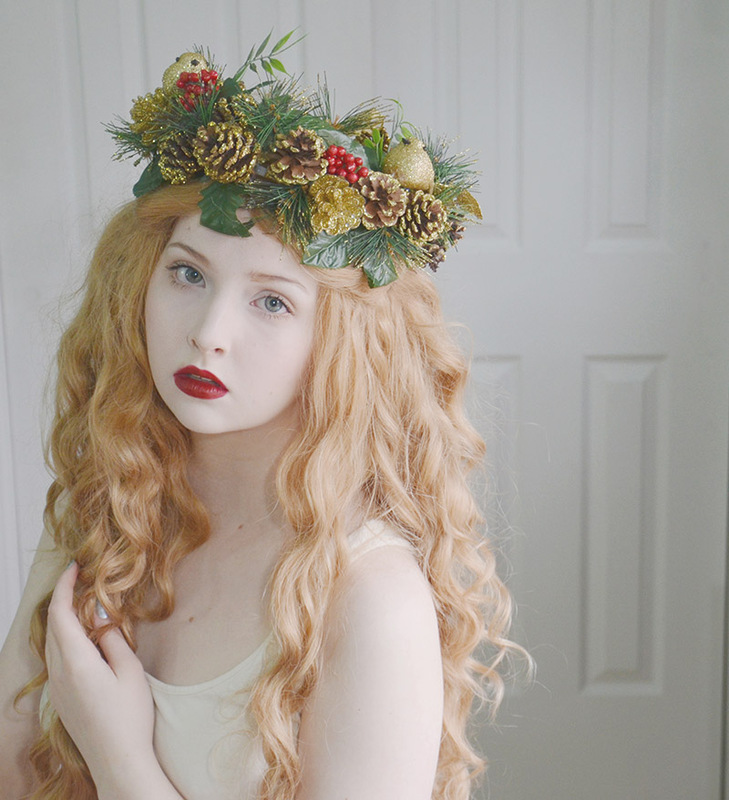 However I DID make a video about a holiday themed pinecone crown, which is posted here. Not interesting enough to have its own post but I thought I would mention it here! Whether you celebrate or not, I hope you enjoy the holidays and have a lovely break! A Fabric Haul & Project Plans! This is super impressive! Great work! Wow, your costumes are just stunning! 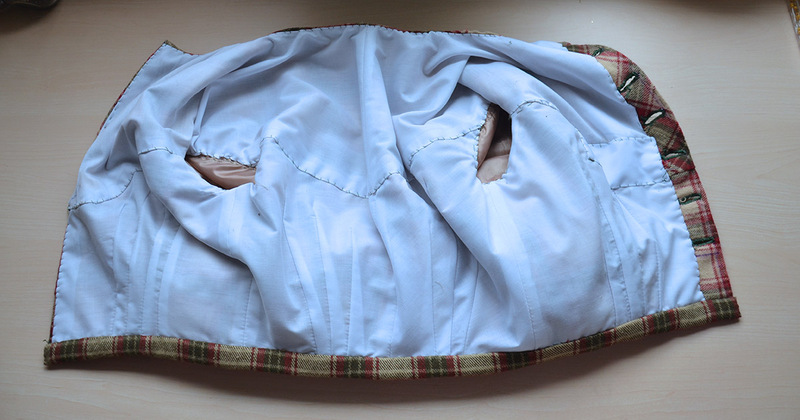 You should send your portfolio to theatre costume departments, absolutely (I work in professional theatre and haven’t seen someone able to sew like you without being trained before). I’ve never seen a sleeve pattern like that before- very interesting! I like the lace collar. I would like it better if it matched the rest of the lace, but it’s not a very noticeable difference. 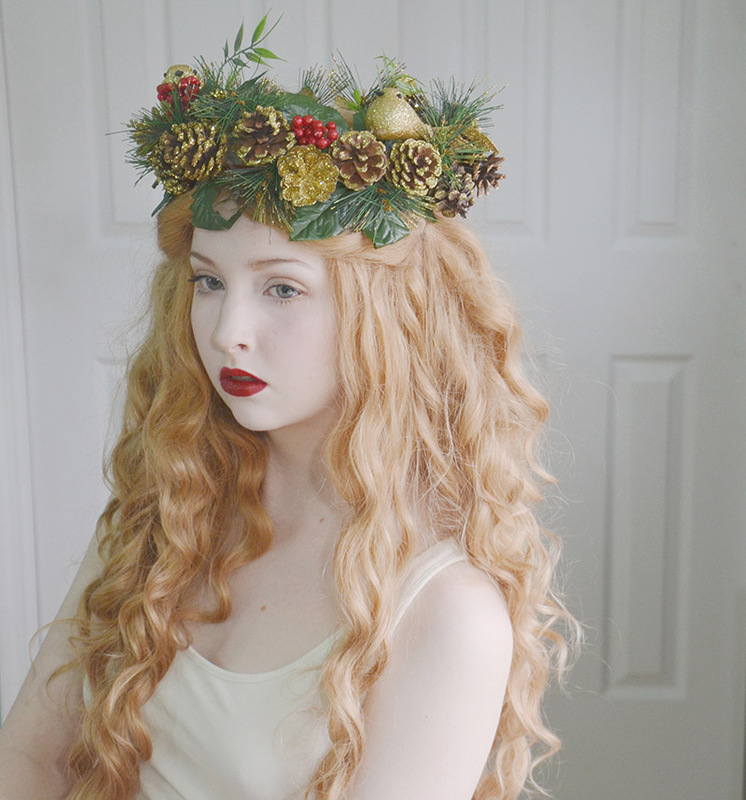 That crown is beautiful!